Ladies and gentlefreaks, it gives me tremendous pleasure to announce the release of Secret Antiquities #1, the latest DCC RPG third-party publisher supplement. Part journal, part zine, Secret Antiquities documents the landscape of Esoteric America, a weird historical setting for DCC RPG. Fans of The Chained Coffin know I believe America is as fantastic a place as Nehwon, Hyperboria, or Middle Earth, and makes a terrific setting for role-playing campaigns. Secret Antiquities examines American history, folklore, and urban legends, as interpreted through the strange lens of DCC RPG. This first issue has been a labor of love, a mixture of vanity press and art project that simply had to escape my fevered brain. 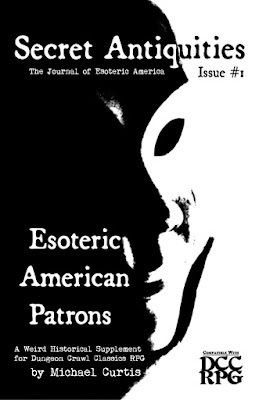 The inaugural issue describes seven Esoteric American patrons for DCC RPG, including Uncle Sam, his twisted twin, the Anti-Sam, Stagger Lee, the Old Man of the Mountain, the Dead Rock Star, and more. Five of the patrons have full patron descriptions, while the remaining two are in an abridged format. While intended for use in DCC RPG campaigns set in Esoteric America, the contents of Secret Antiquities can easily be introduced into standard DCC fantasy campaigns, and makes a superb companion to Black Powder, Black Magic, Shudder Mountain campaigns, and other less traditional game settings. The 94 pp. first issue is available via Lulu for $9.99 in print and $4.99 in PDF. Thank you and welcome to the Land of the Freak and the Home of the Strange!